The see-saw winning ways of Lorena/Annika… I just love it don’t you? It’s way better than the Tiger/Phil battle in my opinion. It’s seems more civilized in some ways – less bitchy, which is ironic. As much as I love seeing Lorena wipe out the field, it’s more fun to watch a tight race. I was really happy to see Morgan shoot a 66 – she’s got so much game, it’s a shame she hasn’t done better this year. Hopefully this final round will spur her on for the rest of the year and she’s come out on top soon. Annika started so well, but ended tied for 11th. Not too shabby, but I’m sure she was disappointed with her 71. Christina Kim was in fine form, which I love to see. I really missed her at the Solheim Cup last year. I hope she plays her way onto the 2009 team. She deserves to be there. 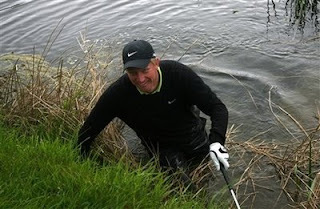 Oh, before I forget, a big congratulations and a towel go out to Richard Finch for making a big splash at the Irish Open. Who does he think he is…Aqua Man? “I had considered chipping out backwards before going for the green with my fourth but, when I rehearsed a stance and realised that I had one, I decided to go for it,” he said. I wonder if it had been the 15th hole if he would have taken the same risk.